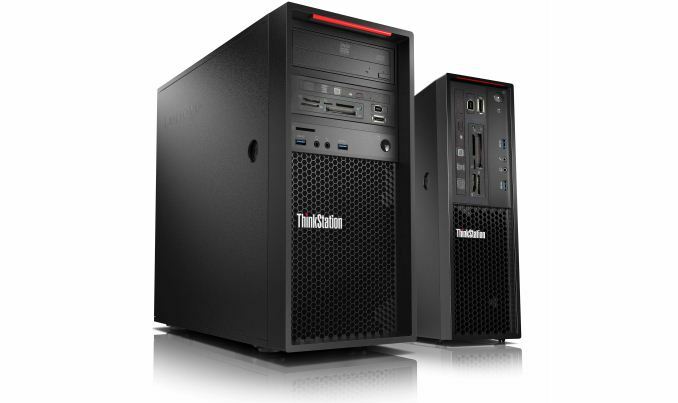 Today Lenovo is announcing an upgrade to its entry-level ThinkStation P300-series workstations. The update revolves around two new updates: firstly Intel’s Xeon E3 v6 (or 7th generation Core) processors featuring the Kaby Lake microarchitecture, but also secondly NVIDIA’s Quadro professional graphics cards powered by the Pascal architecture. The new ThinkStation P320 systems inherit form-factors and price-points from the previous-generation ThinkStation P310, but offer higher performance due to newer CPUs and GPUs as well as faster M.2 SSDs. The machines will be available starting from late April. The Lenovo ThinkStation P320-series tower and SFF workstations are based on Intel’s C236 PCH, which relates back to the new Xeon E3 v6 announced today. Variants of the P320 using Intel’s 7th generation Core i3/i5/i7 processors without ECC memory and other advantages that Xeon CPUs provide will also be available. The workstations support up to 64 GB of DDR4-2400 memory, two M.2 PCIe NVMe SSD (up to 1 TB each) as well as up to 2/4 (SFF/tower) 3.5” storage drives or up to 3/4 (SFF/tower) 2.5” SSDs/HDDs. When it comes to I/O capabilities, both tower and SFF machines are equipped with a 2×2 802.11ac Wi-Fi + Bluetooth 4.0 module (Intel's AC8265), gigabit ethernet, USB 2.0/3.0 ports, DisplayPort and D-Sub outputs and so on. 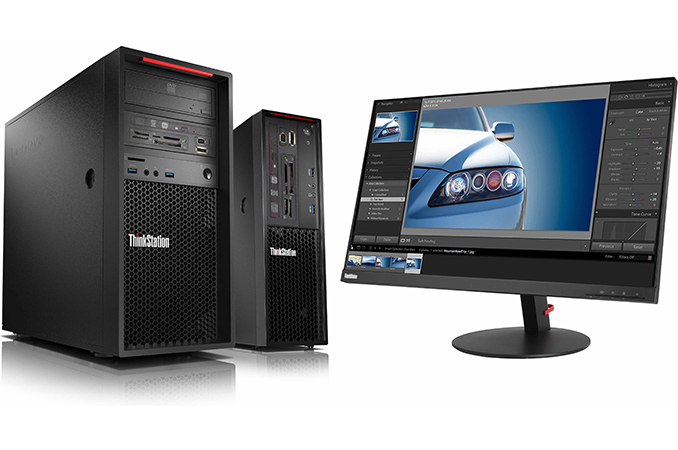 Just like other ThinkStation computers from Lenovo, the P320 workstations support the company’s Flex Modules (up to four per machine) that can add a Thunderbolt 3/USB 3.1 Type-C connector, a 29-in-1 card reader, a FireWire port, a slim ODD or an eSATA header to the front panel of the PC. 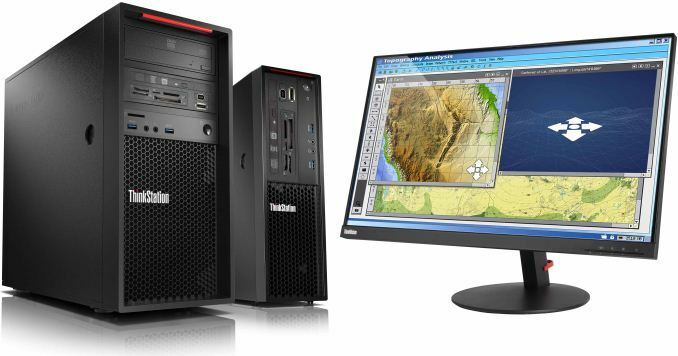 Traditionally, graphics is what divides Lenovo’s big and small workstations. 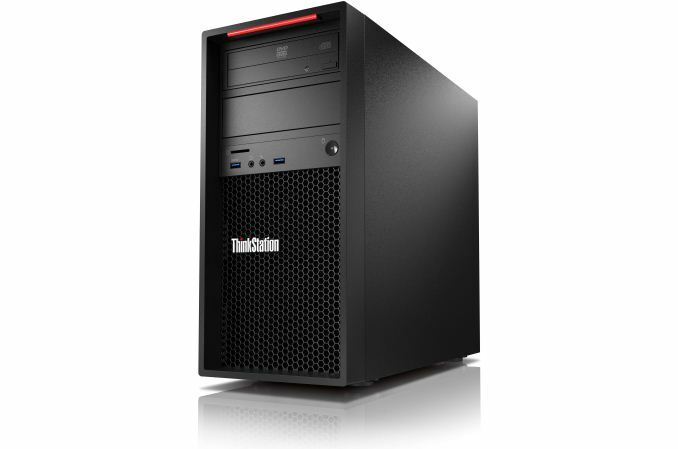 The tower version of the ThinkStation P320 can support up to two NVIDIA’s Quadro P4000 professional graphics adapters featuring the GP104GL GPU (1792 stream processors, up to 105 W TDP) with 8 GB of GDDR5 memory each. Meanwhile, the SFF flavor of the ThinkStation P320 supports up to two low-profile Quadro P1000 cards based on the GP107GL GPU (640 stream processors, 47 W TDP) with 4 GB of memory. The new Quadro video cards featuring the Pascal architecture represent a significant upgrade for Lenovo’s entry-level workstations as current-gen ThinkStation P310 machines are shipped with Kepler-based Quadro K1200 introduced over two years ago (and based on an architecture from 2014). 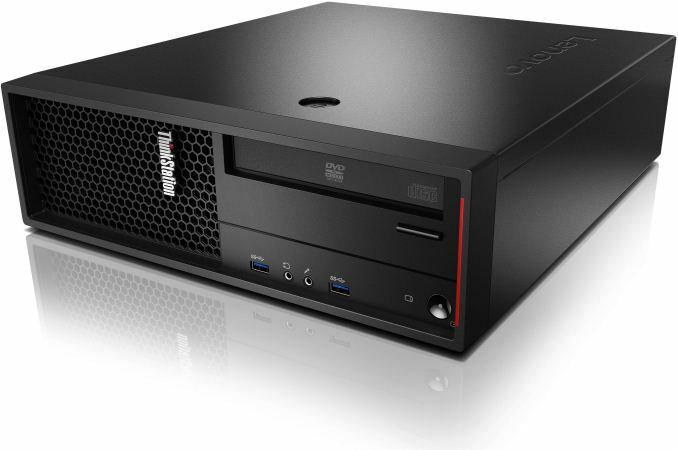 The added graphics horsepower enabled Lenovo to position the ThinkStation P320-series workstations not only for entry-level 3D CAD/CAM applications but also for VR workloads for mechanical and design engineers. Meanwhile, if the systems are ordered primarily for 2D and business applications, Lenovo can also equip them with appropriate NVIDIA NVS multi-monitor graphics cards. Since there are still customers who use Microsoft’s Windows 7 operating system and who intend to do so for a while, Lenovo offers Windows 7 x64 on its ThinkStation P320-series workstation by downgrading the Windows 10 Pro x64. Since the official support for Windows 7 does not exist for the new Kaby Lake CPUs, Lenovo allows customers to install appropriate Skylake processors – either the Xeon E3 v5 or the 6th generation Core i3/i5/i7. Lenovo plans to start selling the ThinkStation P320 Tower and the ThinkStation P320 SFF in late April. Pricing of the products is still being finalized, but it should be consistent with the previous generation P300-series workstations, the company told us. At present, the ThinkStation P310 Tower and the ThinkStation P310 SFF start at $719, and we expect the P320 to be similar.